The Bureau of Economic Analysis released 2016 GDP data for metropolitan areas earlier this week. 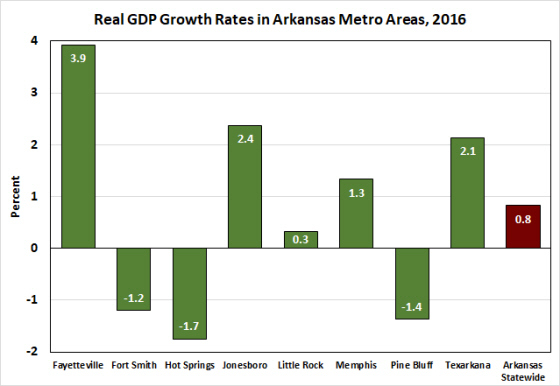 The data for Arkansas metro areas show relatively strong growth in Fayetteville, Jonesboro, and Texarkana. 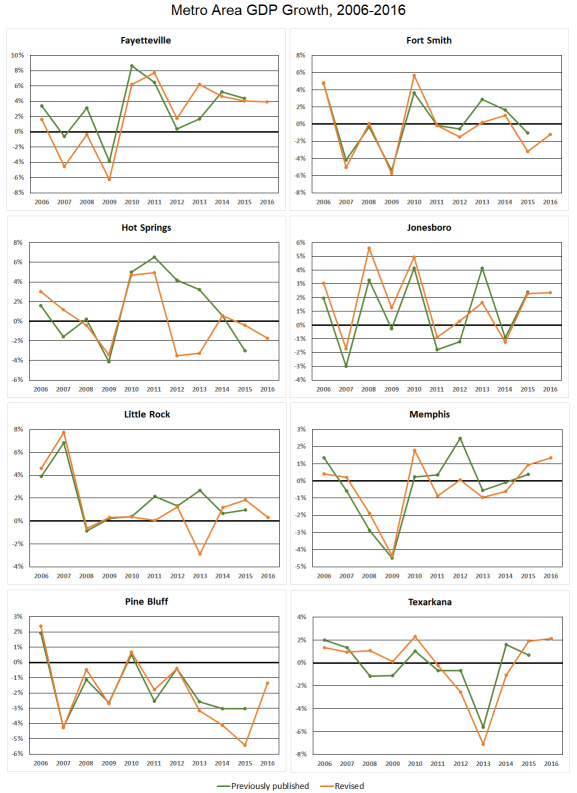 Real GDP contracted in Fort Smith, Hot Springs and Pine Bluff. It should be noted that real GDP data are adjusted for the overall rate of inflation. However, they are not adjusted for changes in population growth. That is, real GDP growth can be decomposed into two components: growth due to population increase and growth due to the expansion of output per capita. 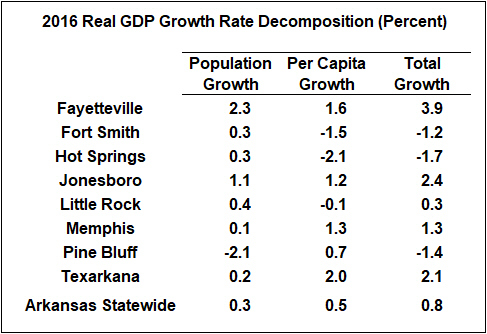 As shown in the table below, the decomposition shows differing characteristics of growth in the various metro areas covering parts of Arkansas. For example, nearly 60% of the GDP growth in the Fayetteville metro area is attributable to population growth, leaving a per capita growth rate of 1.6%. On the other hand, slow population growth in Texarkana means that most of the overall GDP growth in that metro area reflects increases in output per person — at an even faster pace than in Northwest Arkansas! 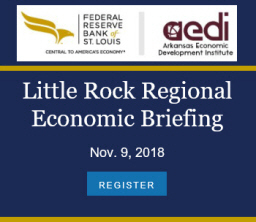 In Pine Bluff, population is contracting more rapidly than overall GDP growth, implying a positive growth rate per person in spite of the overall negative growth rate. GDP is intended to measure the entire output of an economy — the sum of all goods and services produced within a particular geographic area. The calculation of such a comprehensive measure of economic activity is necessarily complex and is often subject to revision as more information becomes available. Consequently, the initial estimates of 2016 metro area GDP that were released this week are quite likely to be revised in the future. The data released earlier this week includes revisions to the previously published estimates for 2001-2015. As illustrated by the set of charts below, the magnitude of these revisions can be substantial. For example, the data that came a year ago showed Hot Springs growth in the range of 3 to 4% in 2012 and 2013. The newly revised and updated figures show growth over the same period to have been negative 3 to 4%. This is a rather extreme example of the revisions typically observed, but it highlights the uncertainty associated with originally published estimates of metro area GDP statistics.